There are rare and special moments when a piece of music hits you like a ton of bricks. It's a gripping realization that this artist is saying and feeling everything that your own headspace has ever considered. For me, that moment came with Adult Mom and last year, the project of Steph Knipe and their bandmates challenged me to survive. It should challenge you, too and during a phone conversation Steph revealed their own personal struggles that brought them to this point - the survival that was required to create and welcome listeners to Momentary Lapse of Happily and the chapters that come after. Adult Mom is back in the studio to record the follow-up to Momentary Lapse of Happily, but this time things are different. There are far more eyes and ears on the once bedroom project of Steph Knipe and it’s something they’re aware of, but won’t let affect them. Writing Momentary Lapse of Happily was about “being selfish,” but in a good way. Steph took some of the most tumultuous moments in their life and turned them to songs - thirteen, glorious songs of growing, learning to love yourself and overcoming. 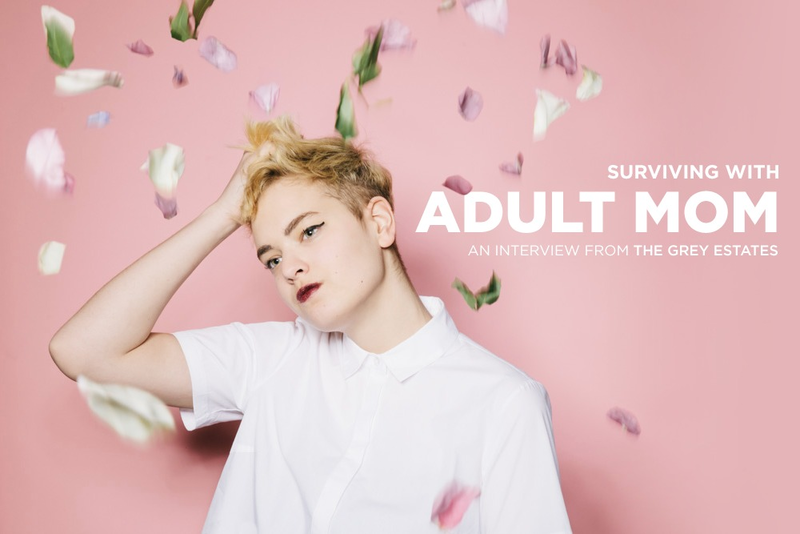 Survival has always been at the heart of Adult Mom, but it played a particularly important role with their last album. After a period of three intense back-to-back relationships, Steph was alone. Coming out as queer to their parents, the only thing Steph could find solace in was songwriting. From those early solo Garageband demos to this upcoming album, Steph wants the songs to speak for themselves, which in turn allows the listeners to internalize the material for themselves, Steph said. The most remarkable part about this story of survival is how it all began - with cover songs, compilations and an iPhone. With an acoustic guitar and the songs of Rilo Kiley and Bright Eyes, Steph learned guitar, and would later experiment in GarageBand, recording early demos on an iPhone, playing songs over and over until they sounded perfect. It never occurred to Steph that Adult Mom could go beyond what it was until an annual college tradition. A full band joined Steph in the studio for the first time on the Sometimes Bad Happens EP and future touring, their presence providing a “cathartic experience,” when Steph relieves some of their darkest moments during live performances. Steph wants listeners to find that same catharsis or solidarity in their live performances and songs. It’s been on the road, sharing their heart live, that Adult Mom has found some of their most memorable moments as a band - when fans sing back every word or approach after a show to say how much their music means. Adult Mom’s touring ensemble and whether it's a full band on the road or just Steph can depend on scheduling and current life situations, but touring, despite its grueling nature, has “opened so many doors,” for the band. Steph admits a struggle with an anxiety disorder and the very act of touring is productive for their mental health, keeping their mind busy and and validating that being a musician is one of their favorite jobs ever. For now, the ride continues and as Steph eyes a future university graduation and a new album there's a lot of unknowns ahead in the future, but it's the here and now that Steph is focused on. "This has been intense and really cool and scary," Steph said. "We started touring more and now that I'm graduating people ask what's next and what I'm doing and I have no idea. I just hope I'll be able to continue to play and I think a lot about what it'll be like to keep this going. I think I've grown in a lot of ways from this experience."